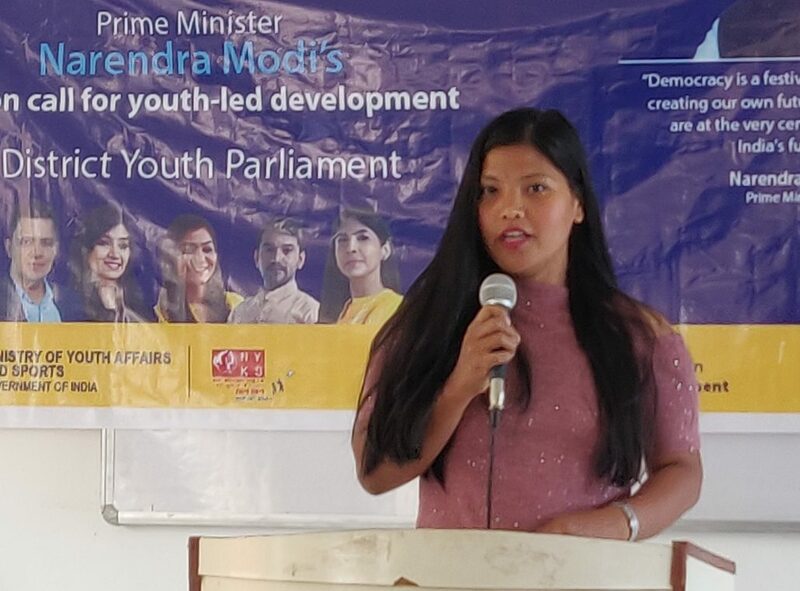 Keeping in line with the Central Government’s initiative to strengthen the democratic ethos of the country, the District Youth Parliament Festival (DYPF) was on Monday held youth parliament across several colleges of the state of Arunachal Pradesh. The DYPF in the state was a follow up to the National Youth Parliament Festival which was held across the country from January 17 to 19 last under the initiative of the Ministry of Sports and Youth Affairs. The festival is a platform where youths are given an opportunity to share their ideas on how to make India better. For Papum Pare district, the festival was organized at the Dera Natung Government College (DNGC) in Itanagar. The programme was jointly organized by the NSS unit of DNGC and Nehru Yuva Kendra (NYK), Itanagar. In all four topics viz India sets Global Narratives on Terrorism, India sets Global Narratives on Economic Offenders, India sets Global Narratives on Climate Change and Khelo India: A Gateway for Budding Sportsperson, Best time for Indian Sport Persons to make a mark were given to the participants for discussion. Besides the scholars of DNGC, students from Vivekananda Kendra Vidyalaya, Nirjuli, Rajiv Gandhi University and volunteers from Nehru Yuva Kendra participated in the event. It was informed that the top five best speakers from the DYPF would further go on to compete in the State Youth Parliament Festival which is expected to be held soon. The venue for the DYPF in Bomdila was the Government College and the programme was organized by its NSS Unit headed by programme officer T L Minto. Speaking on the role of youths in a democratic set up, College principal S Khandu opined that such endeavors would go a long way in strengthening the fabric of democracy. The mock Parliament saw massive participation of the college students and faculty members besides participation of senior students from the GHSS Bomdila. The festival here was organized at the Indira Gandhi Government College in which a large number of students from Lohit, Namsai and Lower Dibang Valley districts also participated. Addressing the youths, Dr Kangki Megu, the college exhorted them to emerge as the role model for the Indian Parliamentarians. Resource persons from the department of political science also briefed the participants about the procedural aspects for conducting parliamentary proceedings. The participants here were divided into treasury bench and opposition bench and proceedings of the house were conducted inside the smart classroom with specified sitting arrangements/proper layout. The speaker conducted the business of the house as per the approved agenda. On completion of the agenda of business for the day, the speaker adjourned the house and following which the top five best participants were selected.